Forget about your big bed — and that comfy recliner. Before you sign up for any mission to Mars, be prepared to say goodbye to the concept of the bedroom as you know it. On Mars, as in outer space generally, it would be an unimaginable luxury to have a big bed with a thick mattress and a heavy comforter. Given the exorbitant cost of sending things to Mars and the constraints of the cramped habitats we're likely to build there, we’ll need a whole new set of design principles for furniture and interior spaces on the red planet. With this challenge in mind, a team of designers from IKEA gathered recently in the Utah desert to spend three days in a mock Mars habitat thinking about designing furniture for a space mission (or a “tiny home” here on Earth). Inside the two-story, 33-foot-wide cylinder, one the designers, Robert Janson, said he and his teammates “quickly realized the necessity of privacy.” They also realized that the furniture we’re all familiar with tends to be bigger than necessary. “We had these bunk beds that were taking up lots of space the whole day, and the only time we really used them was for sleeping,” Janson explained. “Every object has to have multiple functions — otherwise we just can’t afford it,” said Constance Adams, a Houston-based space architect who served as an advisor to the team. So Janson and the others started to think about how to incorporate beds into the walls like pull-down cots, for example, and how they could use smaller features, like virtual windows showing lifelike video views, to break up the monotony of the environment. Another designer, London-based Christine Lew, created a collection of products like a spacesuit you can shower in and a vacuum-suction bathrobe. These weren’t intended to be commercial products but rather “speculative” objects to get people to think about overlooked comforts of everyday life during long-term space exploration, Lew told the architecture and design magazine Dezeen. 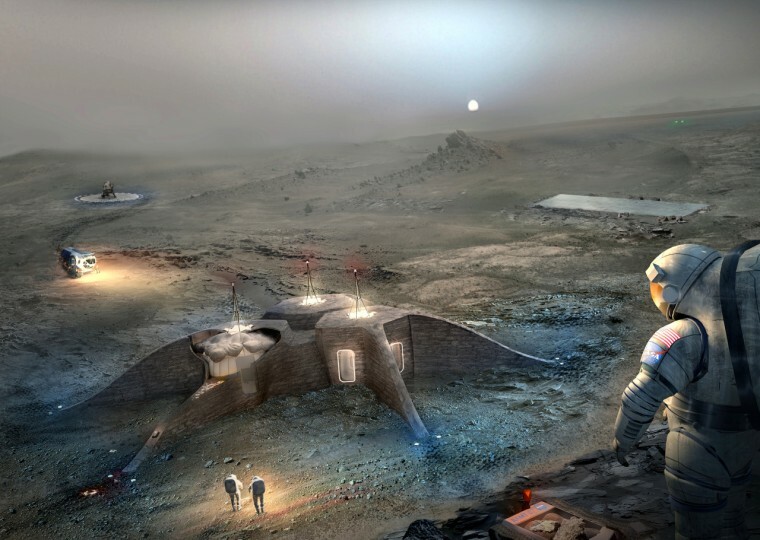 For its part, NASA has asked architecture firms to think about what buildings could look like on Mars. Some of the ideas — submitted to the space agency as part of its 3D-Printed Habitat Challenge — look like luxury cabins. The first-place winner in the design phase of the challenge, the Mars Ice House, was an four-story igloo-like habitat with a spiral staircase, a mix of private and communal spaces, and rooms with curved walls to create an illusion of more space. Of course, these concepts won’t come to fruition unless the tools and materials required for their construction meet the strict engineering requirements for space travel. What’re more, most of the tools and furnishing you pack will need to be useful under the conditions of both zero-gravity in space and Martian gravity (which is about one-third of Earth’s gravity). The spaceship itself might need to be convertible into habitat walls, tables, chairs, and so on. And each of those items would likely also serve multiple functions. If function is one key to designing furniture and habitats on Mars, materials are another. The plastics and synthetic materials found in furniture and other products here on Earth sometimes give off gases that could be dangerous in closed environments, Adams said. She thinks natural materials like wool, wood, and leather might be the best materials for interior furnishings. To promote positive feelings on Mars, designers will look for ways to help astronauts feel an emotional bond with the furniture and décor inside their habitat. Philipp Süssman, another member of the IKEA team, said people tend to feel more connected to objects they build or assemble themselves. Good design could also help ease the interpersonal conflict that might arise on Mars. “King Arthur’s roundtable is a very smart piece of furniture for a group of knights,” Adams said. “You have to design the common spaces so there’s an equality of positions.” And, she added, given the high sound levels that might exist in a Mars habitat filed with whirring fans and other machinery, facing one another at meals and other gatherings might make things easier by facilitating lip-reading. Ultimately, Mars-focused designs could go a long way toward making daily life more comfortable in the harsh Martian environment. And the same design ideas that would work on Mars might also help us create better living spaces here on Earth — especially as we face our own ever-growing environmental challenges.